10th August, 2016 - (Lahore): Islamic Finance provides an ideal mechanism to facilitate Agricultural, Irrigation, Livestock, Micro & Rural financing products to boost the green economy, it’s not only provides the a sustainable solution but creates the positive economic impact in lives of the farmers and rural communities. 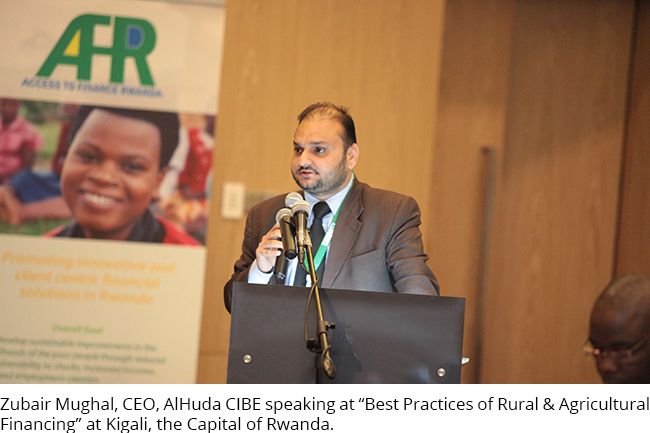 It was stated by Muhammad Zubair Mughal, the Chief Executive Officer, AlHuda Center of Islamic Banking and Economics (CIBE) during the International Conference “Best Practices in Rural & Agricultural Finance” which was jointly organized by African Rural and Agricultural Credit Association (AFRACA) in partnership with the Rwanda Development Bank (BRD), the Ministry of Agriculture, and IFAD in Kigali, the capital of Rwanda last week. Conference was attended more than 300 delegates of 40 countries. While addressing to the audience, Zubair Mughal stated that the impact of Islamic Financial products is much higher than any other financial products due to its uniqueness of asset based financing and other features, these features also averse the diversion of cash fund for other purposes. He mentioned that Islamic Financial products can be utilized in many folds for the development of Agricultural, Rural and Micro Financing, such as, “Murabaha” can be utilize for Purchase of seed, fertilizer, harvesting and planting equipment’s, agri. Inputs, tractor, pesticides, farming goods, Solar Tube-wells etc, while “Salam” is ideal product for Agricultural Financing, through which a farmer can fulfill all the financial needs for whole crop circle e.g. liquidity, seed, pesticide, fertilizer, harvesting, irrigation, market linkages, Istisna’ can be utilize for small manufacturing Business, dairy or Agri. production, construction of warehouses and cold storages, Rural entrepreneur Development, while “ Ijara” is good for Leasing of Tractors, Agri. Equipment, Threshers, Tub wells, small production unit lease, Sugarcane planter, Rice planter, harvesting vehicles etc, Meanwhile, Farmer can utilize Musharaka, Mudaraba & Diminishing Musharaka for Rural housing, forest development, agri. Inputs, farming, sprinkler/drip/solar pumps, tube wells, Microenterprise & SME’S setup’s, Agricultural Joint venture projects, Dairy and livestock development etc. He mentioned that Islamic Finance have specialized financial solutions for each segment of rural poverty e.g. 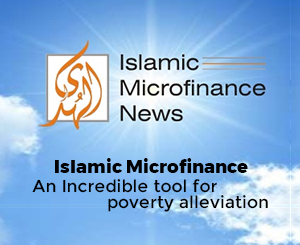 for extreme poor; Zakat, Sadqa, Fitre are available as grant based financial product, for poor or transit poor; Islamic finance have Qard-e-Hassan, Murabaha, Musharaka, Mudaraba etc, while for Non-Transit Poor or fair poor; Islamic Finance have some advance level products “Salam” and “Istisna’” especially for Agricultural sector, while for non-poor and rescue the poor to drop down from their poverty level; Islamic Finance have mechanism of Micro Takaful ( Islamic Micro Insurance) to sustain their financial positioning in the case of any uncertainty especially in rural area’s by Floods, livestock diseases/deaths, drought, heavy rain, health issues, insure the agri. Assets/inputs etc. He also mentioned that Irrigation financing is a big challenge for the development of agricultural, we can observe that only few banks and financial institutions have specialized products to cater the financial needs for irrigation financing but we can understand that Islamic finance again a step ahead to address this issue, In Islamic Finance, we have different products for the Irrigation financing e.g. Murabaha and Ijarah can be utilized for Tube well Financing, Drip/Sprinkler Irrigation System, solar Tube well, micro-sprinkler systems, Installation of electric/ diesel pump etc. to irrigate their fields. Apart from abovee, Islamic Finance has a dedicated product for irrigation namely “Musaqah” It is a contract in which the owner of agricultural land shares its cultivations with another person in return for the services in irrigating the crops or garden but unfortunately, it is rarely utilized in the Industry, even Accounting and Auditing Organization for Islamic Finance Institutions (AAOIFI) issued a proper guideline that how this concept can be opted for issuing the Sukuk (Islamic Bond) for Irrigations projects on crop share basis, he also mentioned that the concept of Muzara’s , Musaqa’a, Mugarasa’s can be utilized for Sharecropping, Irrigation and Orchid Financing respectively. At the end, he mentioned that Islamic Financial products are ideal for financial inclusion for those segment of society who averse interest based financial products due to religious reasons, we have to promote Islamic financial products as system, which can be benefited by Muslim & non-Muslim equally but for Muslim, there is an extra benefit that it is according to their religious believes but for Non-Muslims, it is an ideal solution of Banking, Finance and Business for prosperity and development.